यह क्या कम है ? "The identity of an individual is essentially a function of her choices, rather than the discovery of an immutable attribute." 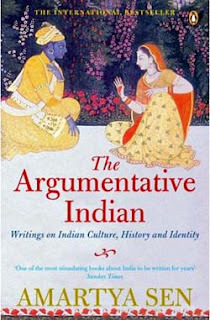 This book is one of the best-known books of Nobel Laureate Amartya Sen. 'The Argumentative Indian' is a collection of sixteen essays on Indian History, Polity, Culture, Tradition, and Identity. Out of sixteen essays, few are very detailed, showing the meticulous research that the author did before writing them. Sometimes the author can be seen to be justifying the titles of essays and topics in too many paragraphs, but altogether it was a nice read, provoking thoughts on a large number of issues. The book gives a detailed account of early seculars like Akbar. . 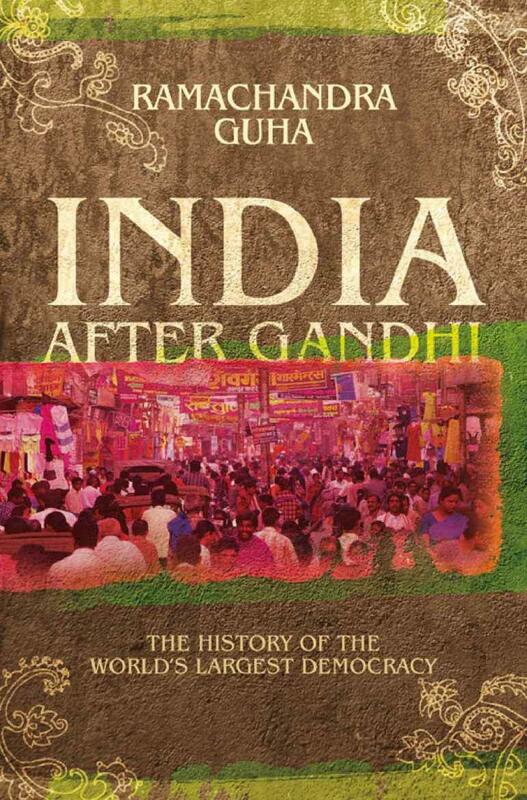 In this book, Sen fights the notion that Indians have been irrational in their activities since ancient times. Instead, he argues by giving historical examples that the argumentative nature has existed since time immemorial. He gives the example of Gargi in Brihadaranyaka Upanishad and of Maitreyi, Yajnavalkya’s wife. Gargi poses a question that even if one accumulates a huge amount of wealth, what should he do to become immortal. This assertion has been quoted and discussed many times in Indian Mythology and Philosophy. The arguments between Krishna and Arjuna at the battlefield of Kurukshetra also make an interesting example. When Arjuna refuses to fight against his relatives, Krishna preaches him about the importance of one's duty. That moment Krishna might have won the argument, but after the epic Mahabharata war, desolation might have proved Arjuna's concerns right. Also in India, people were free to choose their beliefs. Skeptics, agnostics, and atheists have existed throughout Indian History, without being persecuted for going against the established beliefs. Aryabhatta did not have to meet the fate of Galileo. In these lands, religions like Hinduism, Jainism and Buddhism existed without any Holy War or Crusade. Next to look for are the views of Sen on the role of women in Indian Society. He distinguishes the status of women on two parameters: agency and well-being. Agency is being the agent of change or action, similar to holding a position of power where the actions and decisions of concerned woman would have considerable weight. Well-being, on the other hand, is the parity between men and women on various components of Human Development Index (HDI) like literacy, age expectancy etc. Even countries like Japan which have achieved so much in the field of the well-being of women lack as far as women’s role as an agency is concerned, as it is difficult to find women in top corporate structure or in higher governmental posts. One stark fact that needs attention is that president of Indian National Congress in 1925 was Sarojini Naidu and Britain did not have Margaret Thatcher coroneted for next 50 years. Given that president of INC was no ceremonial position, it was an achievement as many democracies did not have or just had given to women the right to vote. In recent past, Bangladesh, India, and Pakistan, all have had a female head of government which is hard to imagine even for the USA in near future. Sen tells many dimensions of gender inequality. Sen cites the case of unequal facilities, like in rural areas girls are not encouraged to go to schools. The result is a huge difference in male and female literacy in India. There is a vast disparity in property ownership. Although the law provides for equality in the inheritance of ancestral property, it is yet to come in mass practice. One more striking fact that Sen gives us that 'Handbook of Human Nutrition Requirement' of WHO classified household work as 'sedentary activity' which can be termed as blatant negligence from the members of male-dominated society. Western Interest in India can be categorized into three approaches according to Sen. The first is 'exoticist' approach which deals with finding what is different, what is superior in India than west. Sometimes this gives exaggerated claims which can be difficult to verify. An example of this can be given from the time when Europe was going through Industrial Revolution and that led to the onset of Imperialism. Then Eastern theorists put forward the theory of mysticism, the theme of which was that the Western Societies were the master of outer self and Indians were the masters of the inner self. Second is the 'magisterial' approach which was propagated to facilitate the foreigners to rule India. This approach said that the Indians required the guardianhood of British to live in an orderly fashion. As James Mill said Indian civilization has 'deserving to be ruled over by higher men.' The third is a 'curatorial' approach which is more rational in nature than other two. It takes into consideration the diverse aspects of India culture and contribution of India in science and other fields. Al Beruni’s Ta’rikh al-Hind, Faxian’s and Xuanzang’s travel accounts fall into this category. Sen brings out the differences between Mahatma Gandhi and Tagore on their course of action for India. Tagore was skeptical of patriotism and nationalism. Tagore argued that patriotism can limit the freedom to engage with ideas from outside the domestic walls and also the freedom to support the causes of people in other countries. Tagore was against the traditionalism and objected to the notion of eternally believing people as a child whereas Gandhi believed that masses were incapable of raising themselves to abstract ideas. In 1908, Tagore wrote a letter to Jagdish Chandra Bose, in which he said, "patriotism cannot be our final spiritual shelter; my refuge is humanity. I will not buy glass for the price of diamonds and will never allow patriotism to triumph over humanity as long as I live." Sen also argues that those who are leaning towards nationalism, are buying a foreign idea. He says that the first nationalist movements occurred in The West. So they are not indigenous to the people of The East. By supporting nationalism they are actually spreading a foreign Idea. On Indian Atomic Bombs Testing in 1998, Sen has strong anti-nuclear views. He opines that India lost its conventional military superiority to nuclear parity with Pakistan after 1998 tests. He also argues that having nuclear weapons is not a guarantee that conventional wars won't happen. Kargil War vindicated this point of view. Sen argues that India could make nuclear bombs was an established fact well before 1998. There was no urgency for this test. India might have thought to be counted amongst world’s super powers but that is yet to be seen and that relies on other factors as well, economy to name one of them. Sen quotes Ashoka, Rabindranath Tagore, Akbar and Satyajit Ray, at will, throughout the book. He gives an interesting viewpoint on Hinduism. India’s identity is of a pluralistic society and one must respect the whole spectrum of beliefs in our country. What author tried to say is that dissent should not be suppressed, but should be discussed objectively. In fact, the author considers the atheists at the other extreme of Hinduism. When the train started running, a young child of our fellow passenger sitting in the direction opposite to that of moving train said, "Mommy, mommy, train peechhe ja rahi hai.” (Mom, the train is moving backwards.) I could not stop smiling. Such is the innocence of the childhood. Thus started our journey. In the morning, little before reaching to Kotdwar, I stood by the gate of coach of the train. The chilly air and the small bushes alongside railway lines were best suited for that place. This was the perfect start of that morning. 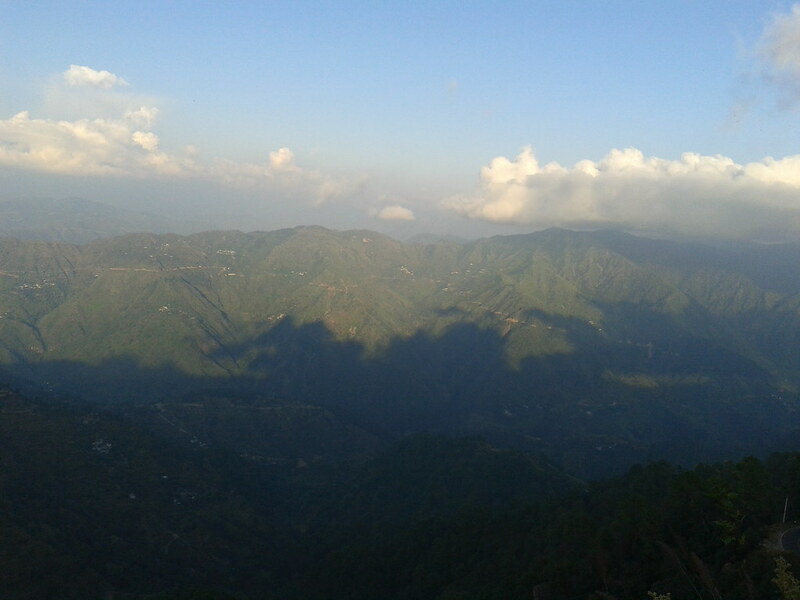 Lansdowne is a quiet, small town situated in the dense cover of chir and deodar trees in Pauri Garhwal district of Uttarakhand. Some 250 km from Delhi, Lansdowne houses the Garhwal Rifles Regimental Centre. Lansdowne traces back its history to the colonial period. It was founded in 1887 and named after then Viceroy of India, Lord Lansdowne and was used as the recruiting centre of the Garhwal Rifles of British Indian Army. Before that it was known as Kaludanda, after Kalu, meaning black and Danda, meaning hill. One can reach Lansdowne via Kotdwar which is well connected by roads and railways. From kotdwar private cabs can be booked or a shared taxi can be taken. Local residents were very warm hearted, one must say. As a true vagabond, we did not have any prior arrangement of accommodation and so had to settle with a hotel near the main market. It is advised that one should book a hotel in advance if one has to stay at a place away from the town center as during weekends the hotels get occupied fast. The first place we visited was Darwan Singh Sangrahalaya, named after Darwan Singh Negi who received Victoria Cross, the prestigious award given to soldiers of British forces, for his bravery in First World War. The museum was situated near Parade Ground and War Memorial, built in the memory of soldiers who lost their lives in First World War. The Parade ground made me think that where did I see a plain ground so large in the mountains before this one. The museum shows the colorful history of Garhwali people, through their traditional dresses, various percussion instruments and nearby places of historical and mythological importance to visit. The museum also records the history of Garhwal Rifles in pictures of its decorated officers and soldiers, shows seized belongings of the enemy army and describes its role in various wars that The Empire and the independent India fought. We also saw the collection of weapons representing a long span of history and also the military uniforms that changed with time. 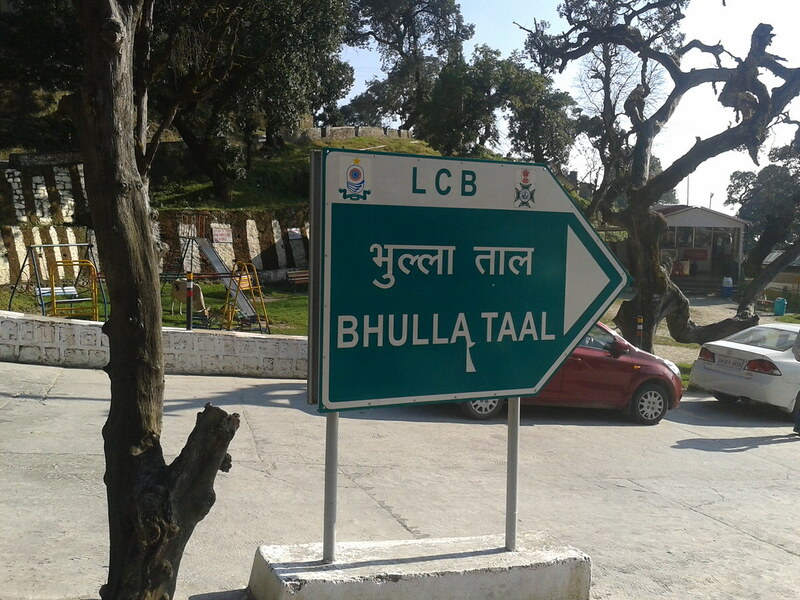 Then we went to Bhulla Tal, a manmade lake situated little away from the Gandhi Chowk, the centre of town. 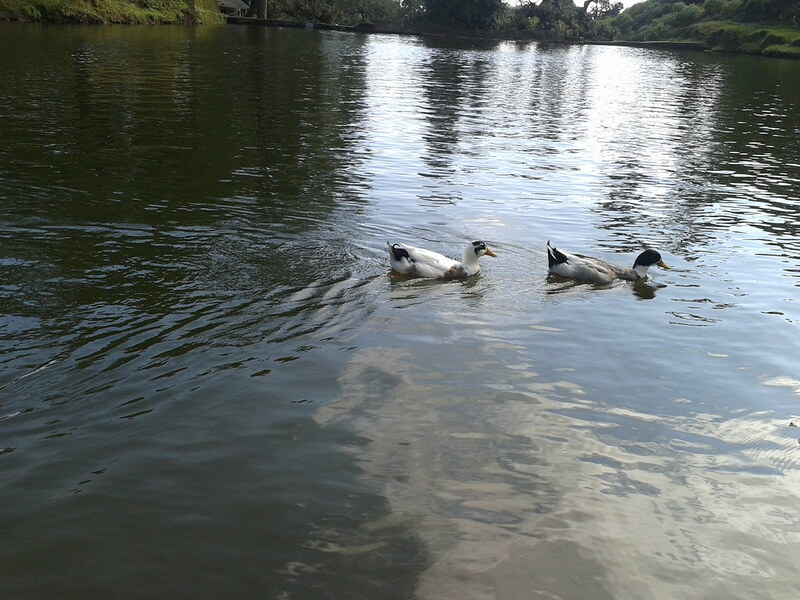 We sat there watching the ducks roaming in water, whose stillness was disturbed by winds and boats. Near the lake was a place where rabbits and guinea pigs were kept. They looked cute while eating grass and moving here and there in their ward. Then we stumbled upon something interesting. 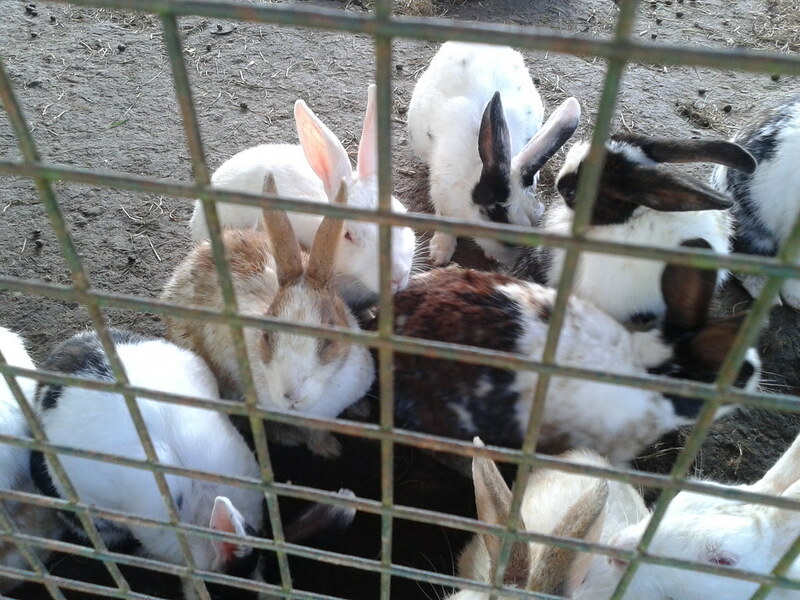 A bottle was kept there with injections and the description on the bottle read that it was used as the stress buster for these little animals. Maybe they also need the stress relieving drugs in such fast paced life of their own. 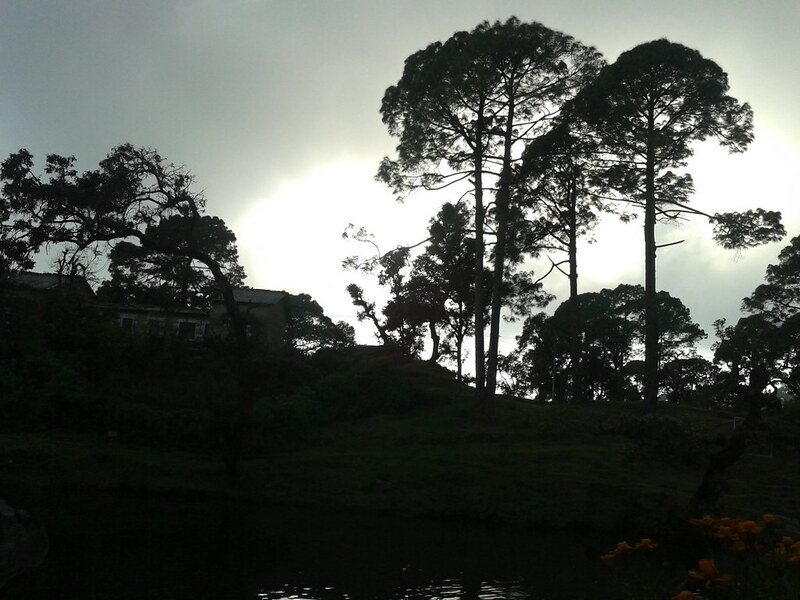 Beyond the Bhulla Tal, there was a place which was serene, lonely and beautiful, surrounded by tall chir pine trees. We sat there for some time looking at distant hills, the road below and the valley further below. 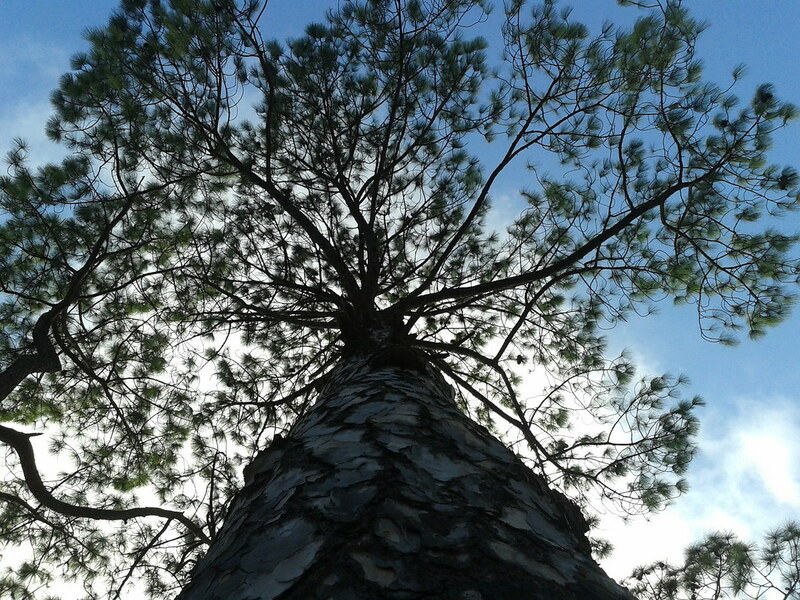 Those trees with blue sky in the background made a perfect picture. We came back again to the lake and had lunch there. Then we started walking for Tip-in-Top. On our way found St. Mary’s Church, which was constructed in the late 1890s. 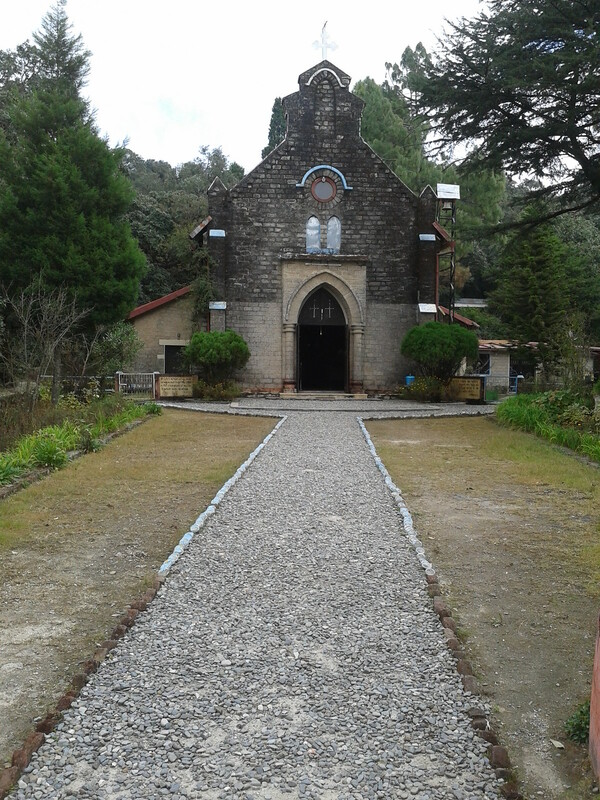 This protestant church is now maintained by Garhwal Rifles. Here you can find booklets on the history of Garhwal Rifles up for sale. There were historical accounts of this church described by few posters. On a round poll in the middle of the church, these lines were written, “Suffer little children to come unto me”, which sounded very similar to me to what Krishna said to Arjuna in Gita. We marched ahead and reached Tip-in-Top. It was a little platform erected for site-seeing. We could see hills, valleys, small villages on the hilly slopes and roads like ropes. 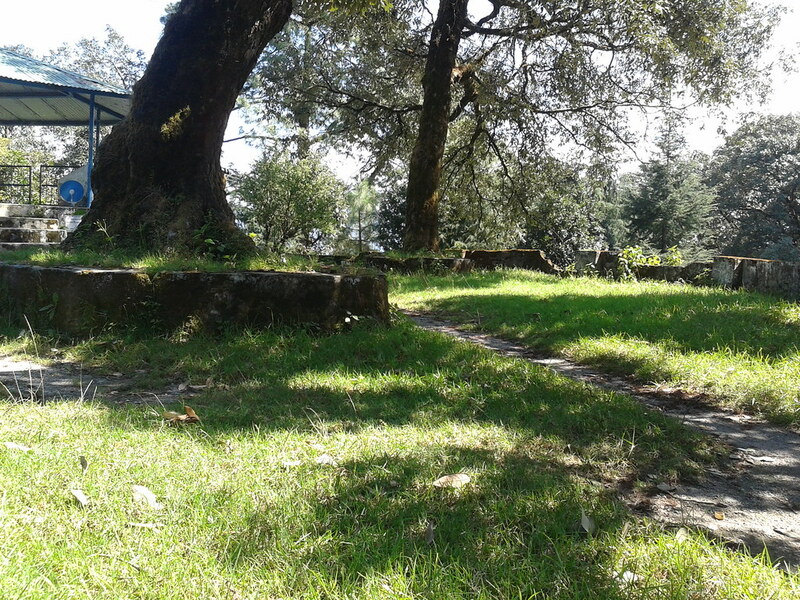 Close to Tip-in-Top are tree huts, a tourist rest house by Garhwal Mandal Vikas Nigam Limited, ideal for a stay with the perfect natural view. 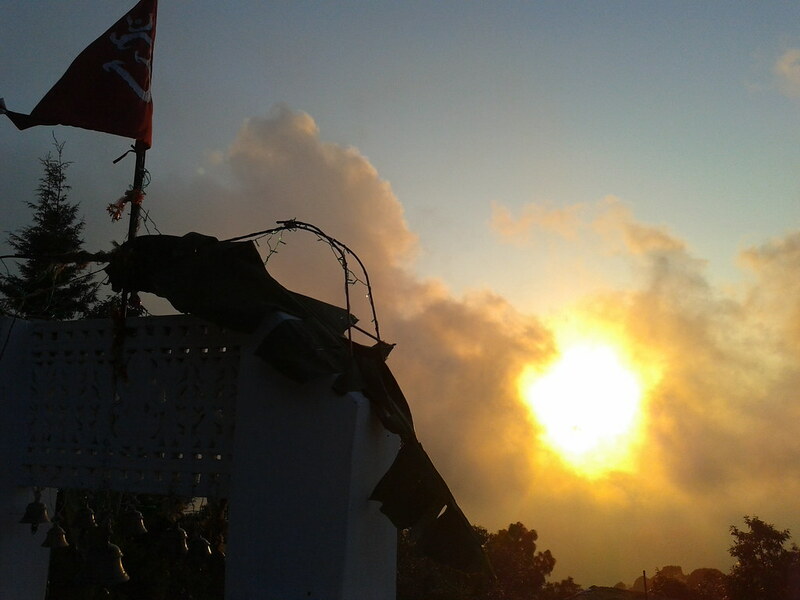 Then we went to Santoshi Mata Mandir, a small temple located on a hill top. Maintained by the Army, nice bhajans were being played there. 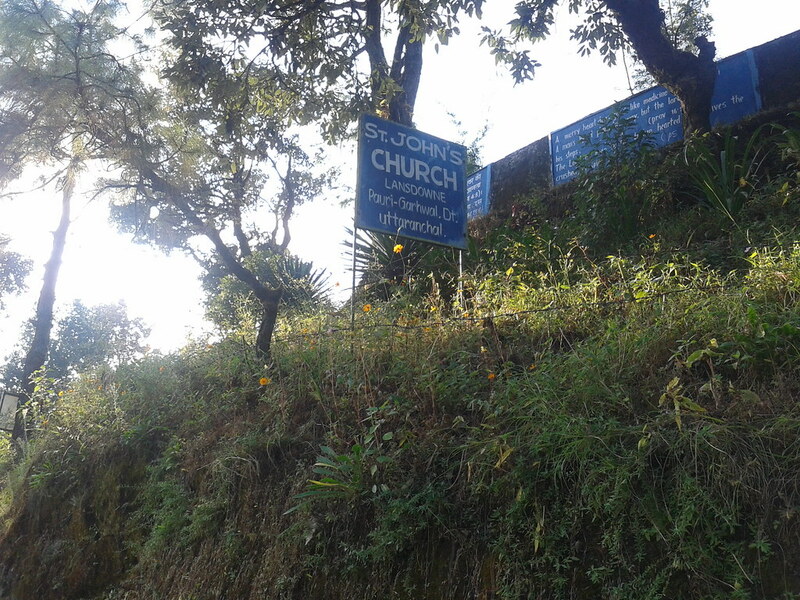 One has to give credit to Garhwal Rifles for taking care of churches and temples and ensuring that this little town does not lose its beauty. The sunset view from Mandir was awesome. 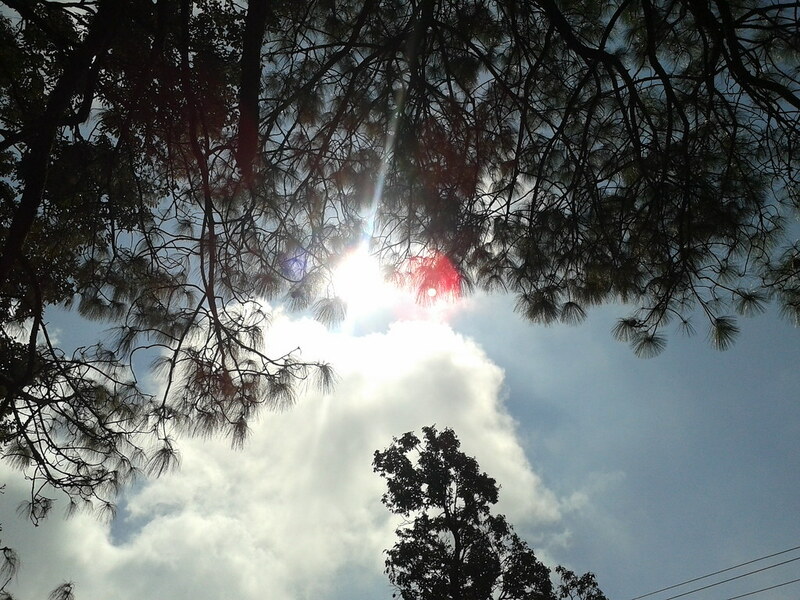 With the sun playing hide and seek with clouds, it was the perfect time to click few pictures. After that, we came back to Gandhi Chowk and went to a small theatre there to watch a movie. The hall was small and very few people were there, hardly ten. 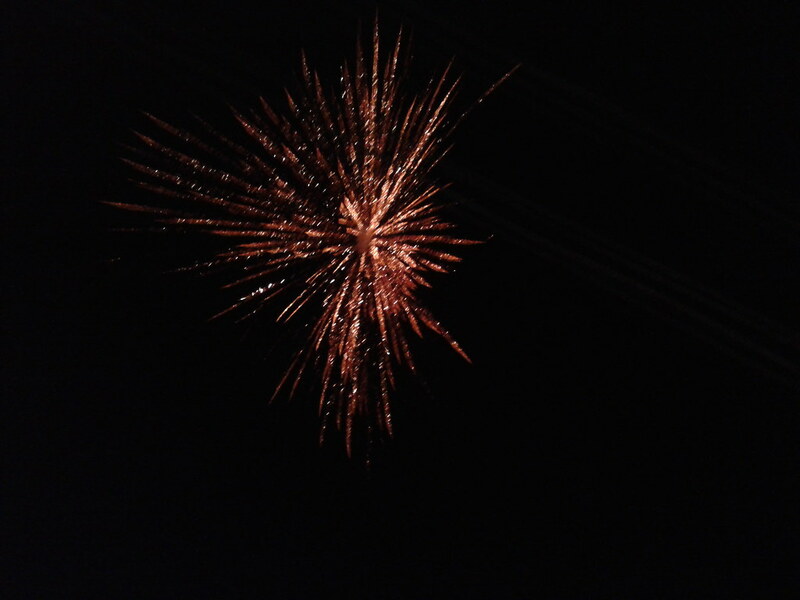 After the movie, it was time for Dussehra celebrations. We mingled readily in the crowd. Considering that it was a small town, there was a huge crowd and it seemed that whole town came to watch the celebrations. When the organizers had some difficulty with burning the effigy of Ravana, because of dew, someone behind me in the crowd said, "We cannot burn Ravana. What will the tourists think of us?" We could not stop laughing. 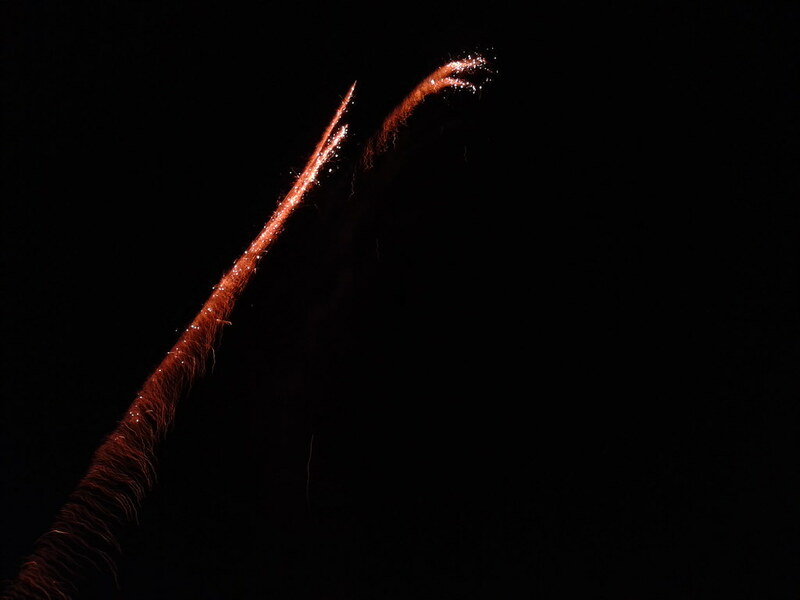 The firework was like fireflies moving with stars in the background. You cannot see these many stars in cities because of lights. what to say about the local bands playing some traditional song? I still love these bands as much as I loved them as a child. Next day we went to St. John’s Church, a catholic one under the aegis of Diocese of Bijnor. It was elegantly built with its history dating back to 1937. It was a peaceful place. We sat there for a while. The small town of Lansdowne was built in characteristic British architecture. The officers’ bungalows, the church facades, benches in churches were beautifully designed and simple in their appearance. There was one place where we could not go because we had to catch the train. It was Bhim Pakora. We inquired about this place from locals who said that according to legends, while living in exile, Pandavas came to this place. Bhim picked one rock and kept it over another. Today this rock can be moved with one's finger’s touch but it does not topple. We wandered in the jungles and then decided to go off the road, down in the valley. The greenery of the valley was very pleasing and sitting there, one would be tempted to get lost somewhere. The place was so quiet that you could hear birds chirruping and sound of leaves when winds move touching them. And all that with cold winds going past you reminding you to enjoy these moments to the fullest. "But the trees seemed to know me. They whispered among themselves and beckoned me nearer. 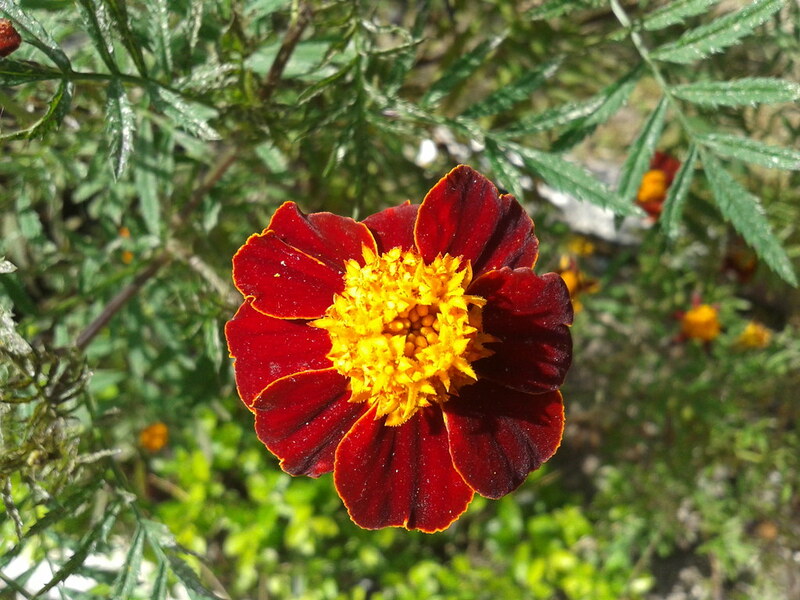 And looking around, I noticed the other small trees and wild plants and grasses had sprung up under the protection of the trees we had placed there." 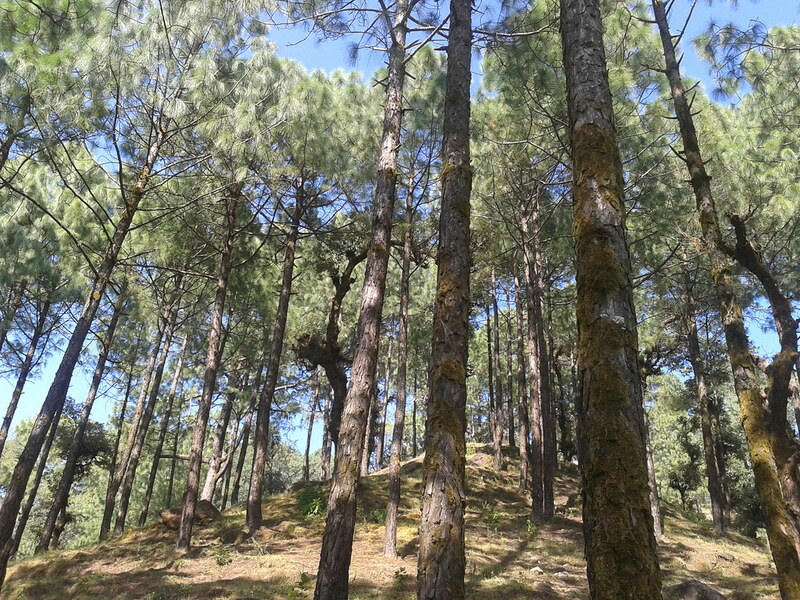 Indeed, oak, pine, chir pine and horse chestnut trees were the true residents of Kasauli. Greeting the new comers, swinging along with the wind, these trees were everywhere. They stood there looking at the passers-by like they owned the place. Ruskin Bond, who was born in Kasauli, described this feeling so beautifully. If it were not up to these trees to stand there, one’s eyes will certainly slip on the mountain slopes all the way down to the valley. 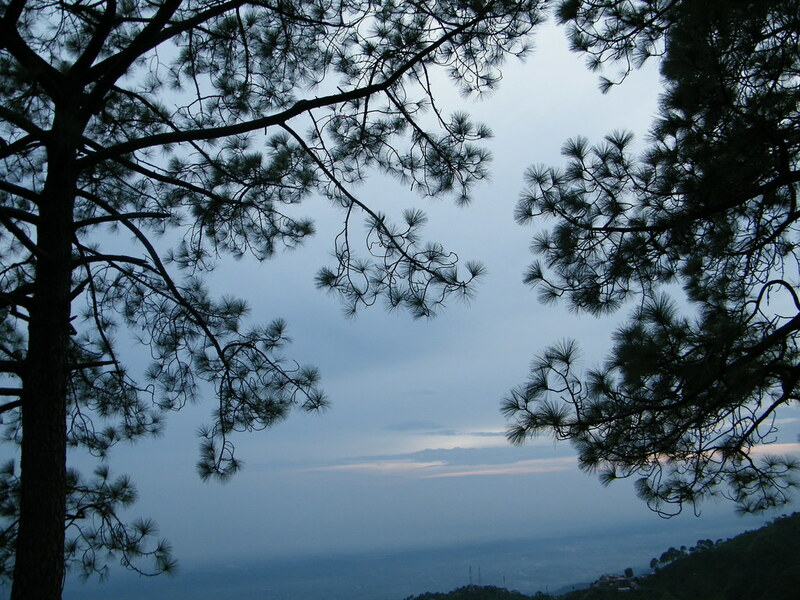 Kasauli is a sleepy little town, secluded and very peaceful, located in Solan district of Himachal Pradesh. The best way to reach there is via Kalka. 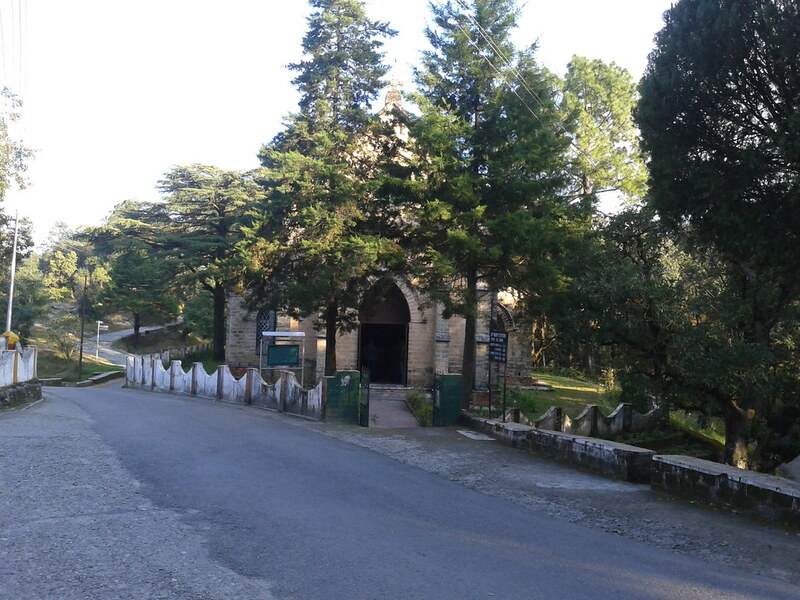 Reach Kalka by Indian Railways and then take a bus or cab from there to Kasauli. At Kalka Railway Station, we saw the Kalka-Shimla Railway trains and for a moment we thought to abandon our plans of Kasauli, instead, go to Shimla. 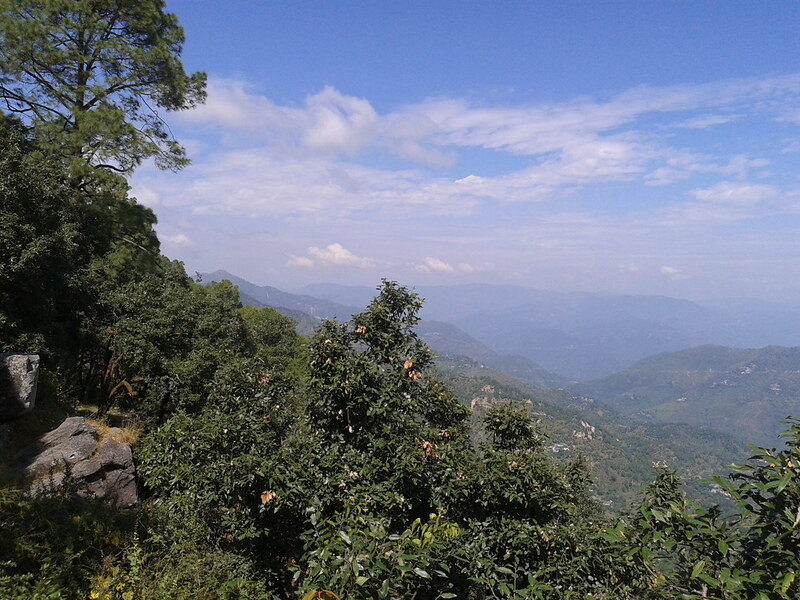 Breathtaking views from Kalka-Shimla train would have been memorable, but then we weighed in favour of Kasauli. 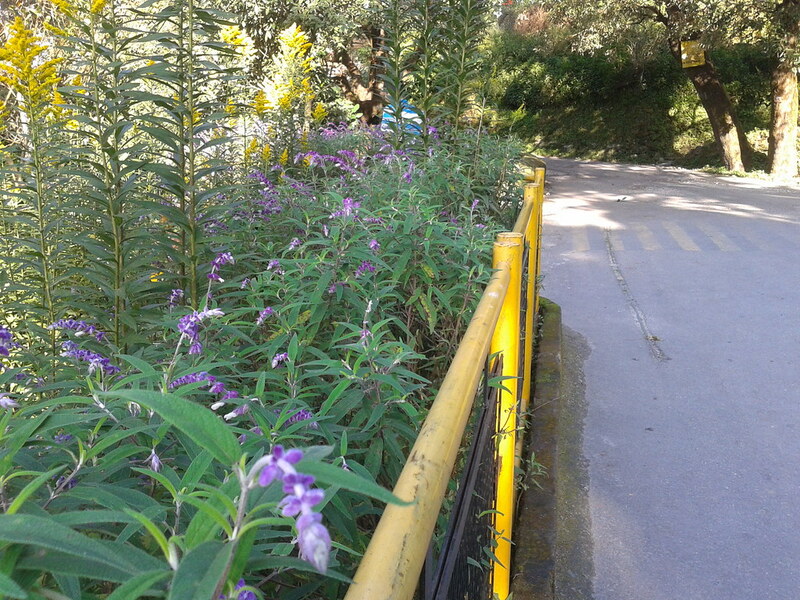 A trip from Kalka's Gandhi Chowk, where we boarded the bus, to Kasauli had all the typical traits of a Himalayan safari. Traveling on narrow, curvy roads with deep gorges on one side we could get a beautiful view of a village from the bus at the top of a hill. Also, we saw how life can be so difficult for small school-going children who had to go to schools at Parwanoo, a town between Kalka and Kasauli, and who could not find a seat in the crowded bus. We reached Kasauli at around 9 am and then had a chai at the bus stand. A chai is always pleasant in such a weather. The weather was very soothing and extra comforting given that we came from Delhi where mercury was continuously in the forties. Then we started the search for a hotel to stay when we found one more new thing which was particularly pleasant to ears. It was the loudspeakers installed along the roadside at Mall Road. There were Hanuman's and Krishna's bhajans being played at a decent volume. Then we found our accommodation. The view from the balcony was good. Clouds came towards us and disappeared. We stayed there a little before we started wandering in the roads unknown to us. 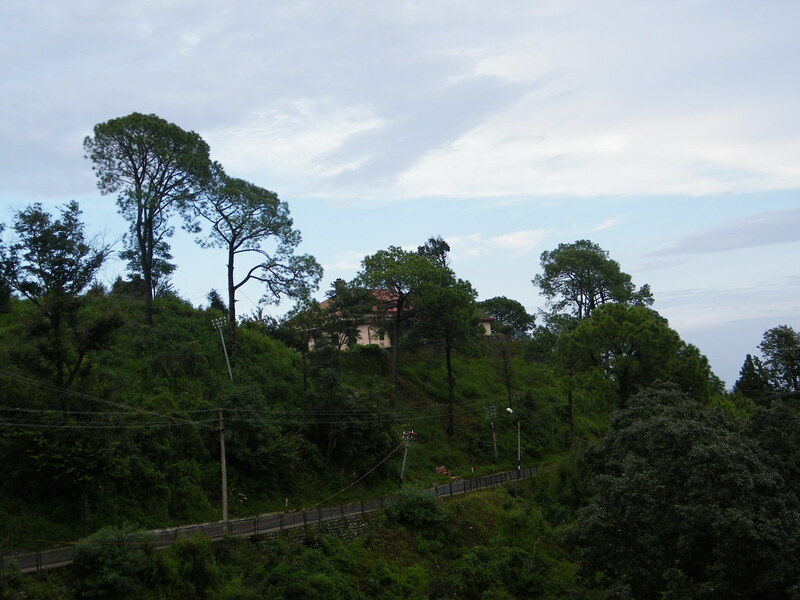 The Kasauli town was situated in a thick forest cover. There were no signs of any rush. 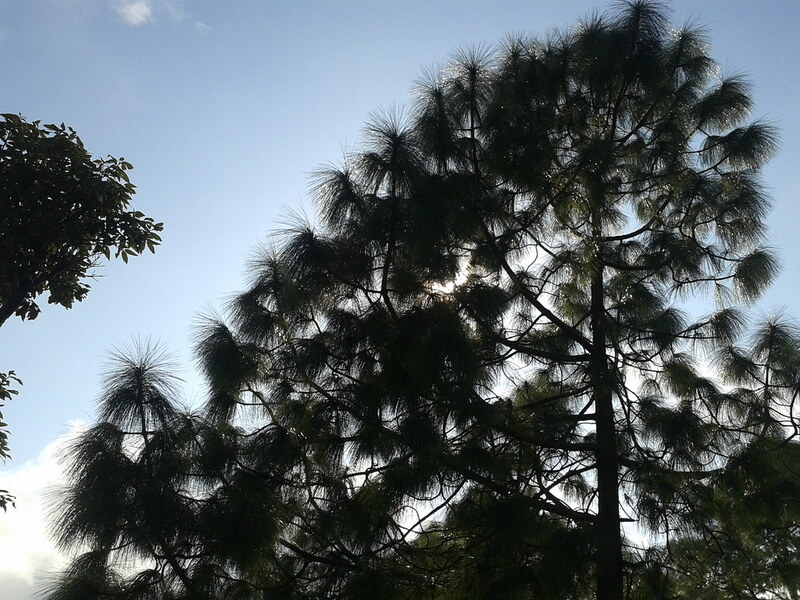 Kasauli also houses an army cantonment which covers most of the upper town. Painted in olive green, the houses and other buildings in the shape of a hut had architectural resemblance with other small hill stations. The architecture was predominantly British. It was easy to spot people donning military fatigues here and there. Walking further we reached town's end and, yes, it is a small town. Then we started hillside walk with beautiful scenes. There were some interesting boards put up instructing not to litter. Then we reached sunset point. I accede that 1 pm is not the ideal time to reach to a sunset park, but we were exploring the mountains and next thing we saw was this sunset point. From this place, one can see cities situated in plains like Chandigarh, Ropar and Jalandhar etc. In fact, there is a concrete structure where one can see the directions of all these cities mentioned. Due to fog and clouds, we could not see places far away, but Chandigarh and Sukhna Lake could be seen as they were nearer. Then we walked further and took a shortcut on a steep slope to reach a road down the hill. 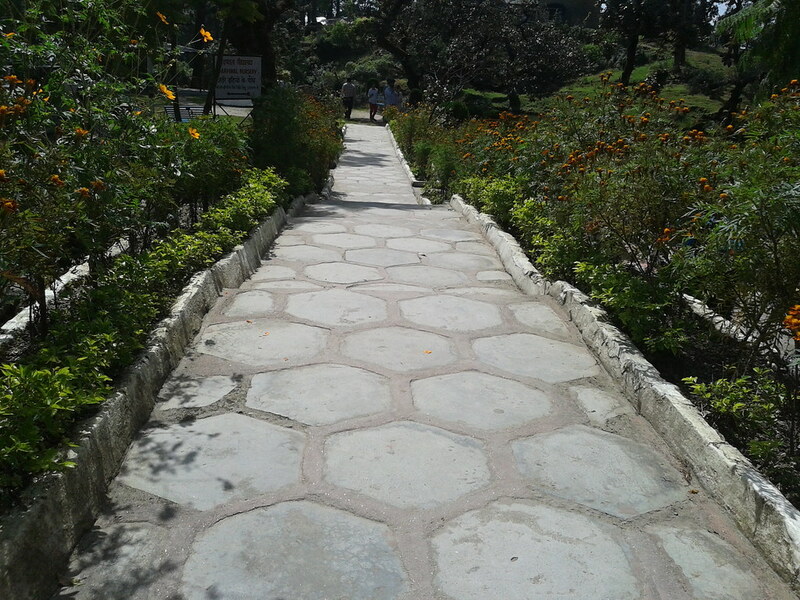 After sometime we reached gates of Air Force Station, Kasauli which encircles the Manki Point. Although there is a temptation to call it Monkey Point, I will stick with Manki Point as this was the name mentioned in all signboards and in the gate pass issued to us at the entrance. Before we could reach there, heavy downpour started. We took shelter in a canteen and had some parathas. 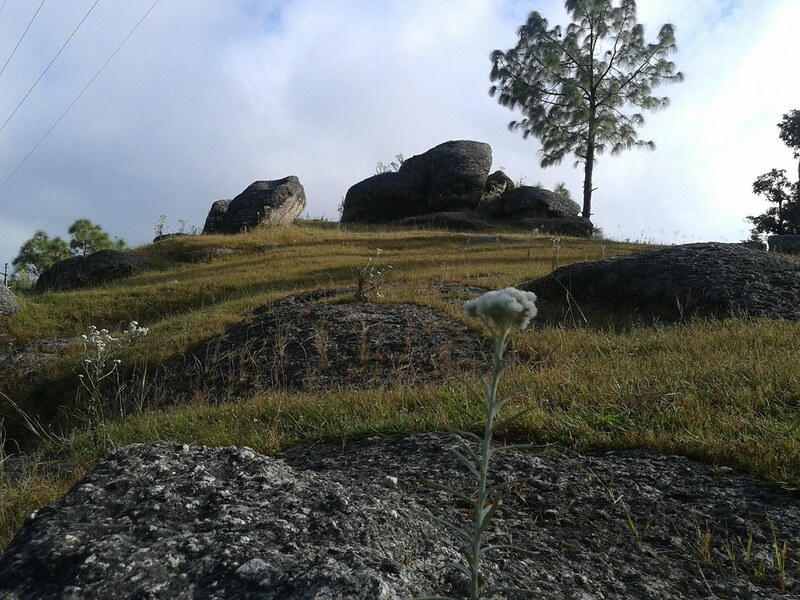 When rain stopped we reached Manki Point, an ancient temple situated on a hill top. As soon as we reached rainfall started again. Legends were that while taking Sanjeevani Buti from the Himalayas to Lanka for unconscious Lakshman, this hilltop was hit by Hanuman's toe. This also gives the hilltop its present shape. Later local persons erected a temple at that place. The lawns of the temple have a helipad. From this place you can have a breathtaking 2700 view of the surrounding hills. We were not able to see too far because of the rain but whatever was visible was mesmerizing. Will we finally realize we cannot eat money. Today is the 150th birth anniversary of Swami Vivekananda, the missionary who spread the Indian philosophy beyond India. A lover of mankind, he strove to promote peace and human brotherhood on the spiritual foundation of the Vedantic Oneness of existence. 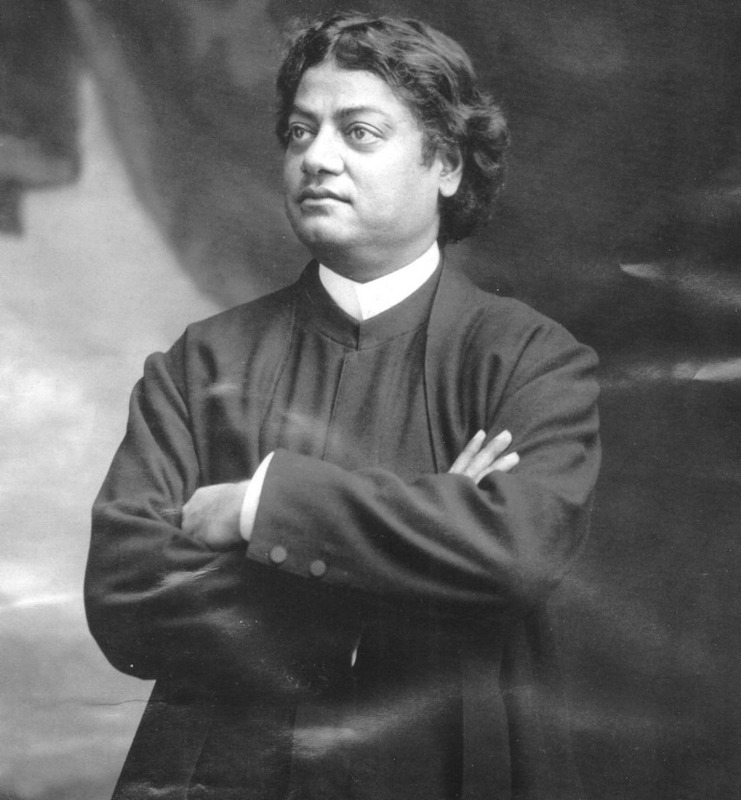 A mystic of the highest order, Vivekananda had a direct and intuitive experience of Reality. He derived his ideas from that unfailing source of wisdom and often presented them in the soul-stirring language of poetry. 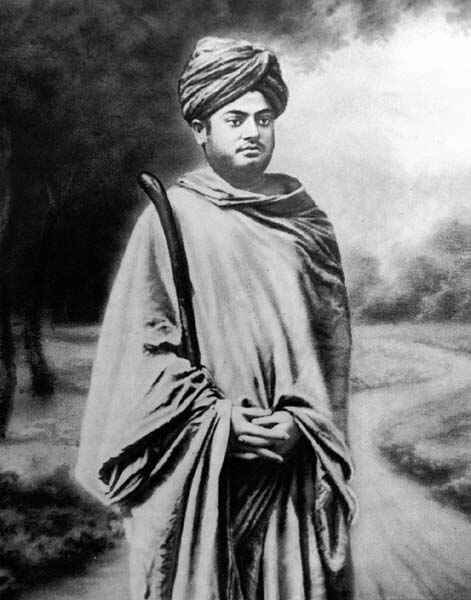 The natural tendency of Vivekananda's mind, like that of his master, Ramakrishna, was to soar above the world and forget itself in contemplation of the Absolute. But another part of his personality bled at the sight of human suffering in East and West alike. It might appear that his mind seldom found a point of rest in its oscillation between contemplation of God and service to man. Be that as it may, he chose, in obedience to a higher call, service to man as his mission on earth; and this choice has endeared him to people in the West. In the course of a short life of thirty-nine years (1863-1902), of which only ten were devoted to public activities and those too in the midst of acute physical suffering, he left for posterity his four classics: Jnana-Yoga, Bhakti-Yoga, Karma-Yoga, and Raja-Yoga, all of which are outstanding treatises on Hindu philosophy. In addition, he delivered innumerable lectures, wrote inspired letters in his own hand to his many friends and disciples, composed numerous poems, and acted as spiritual guide to the many seekers, who came to him for instruction. He also organized the Ramakrishna Order of monks, which is one of the most outstanding religious organization of modern India. It is devoted to the propagation of the Hindu spiritual culture not only in the Swami's native land but also in America and in other parts of the world. I remember a nice poem by Swamiji, titled 'To The Awakened India'. Daring yet. The world in need awaits, O Truth! Forward! Speak thy stirring words. Awake, arise, and dream no more! Which are Eternal Love and Service Free. A spiritual genius of commanding intellect and power, Vivekananda crammed immense labor and achievement into his short life - 1863-1902. Born as Narendranath Datta on 12 January 1863 in Calcutta to Viswanath Datta, an attorney and Bhubaneshwari Devi, a religious and kind-hearted lady. From very childhood, he started showing signs of a great individual. His father was little conspicuous of the activities of his child but provided him an environment where he could grow to his full abilities. During childhood, when other children spent their time playing games, he used to play at meditation. In a famous story, it is said that, once, while he was deep in meditation, a cobra came. All the other children of that room went away, but he continued to be in mediation as if nothing happened. Such was his power of concentration and focus that he shot in succession twelve eggs swinging up and down in a river while having no experience of firing a gun before. His childhood tales describe the life of a monk who would conquer the world by his intellect and humbleness. The child Narendra (Swamiji's childhood name) was very naughty and it was very difficult to calm him down. When all other methods to pacify him failed, his mother Bhuvaneswari Devi would pour cold water over his head, chanting the name of "Shiva", and he would instantly calm down; or if someone said to him that if you do not calm down, Lord Shiva will not let you enter Kailasa, Narendra would be pacified. When he grew up, his mother used to tell him about this method to calm him down, saying, "I asked Lord Shiva for a son and He sent me a demon!" In his childhood, he used to climb a Champaka tree in his friend's house. It was his favorite pastime to hang upside down from that tree. He loved the fragrance of Champaka flowers. 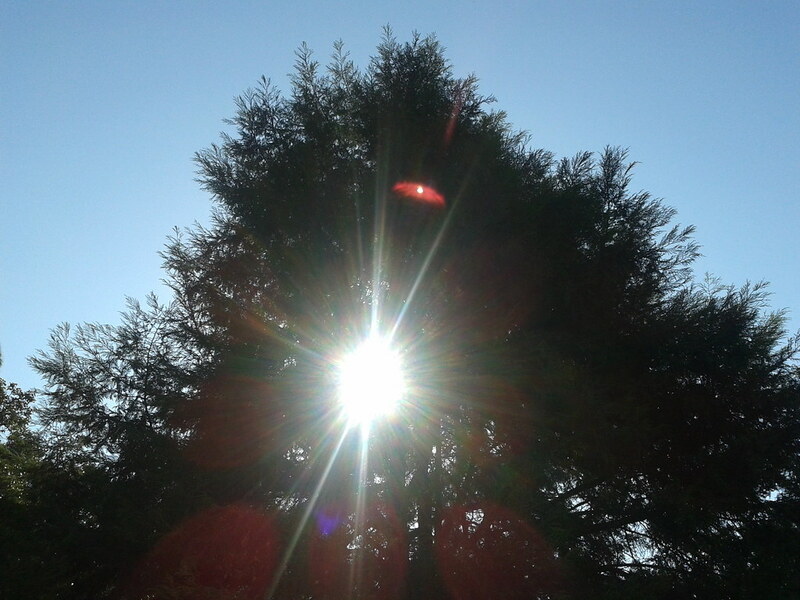 One day when he climbed the tree, the old owner of the house came and said to him that the tree was inhabited by ghosts and one of them is Brahmadaitya. If Narendra would not climb down from the tree, the Brahmadaitya will kill him. Listening to this he immediately climbed down from the tree. As soon as the old person went away, celebrating that he persuaded Narendra to climb down, Narendra climbed up the tree again. Seeing him doing this, his friend asked what is he doing - "The ghost Brahmadaitya will eat you up". Narendra smiled and said, "Do not believe in everything that elders tell you, but also use your conscience. If this tree was a living place of a ghost, then I would have been dead long ago." Such was his fearlessness and belief in his convictions. There is one more story about his courage. One day he was setting a big trapeze in the gymnasium with the help of some people, including an English sailor. During the effort, the trapeze fell and the sailor was knocked unconscious. All other children fled from the fear of police, assuming the sailor to be dead. Narendra stayed there and tore a piece of his cloth to wrap around the sailor's wounds, washed his face and helped him in fighting the injury. Later he moved the sailor to the nearby school where Narendra took care of him for a week. Later he sent the sailor away with a small amount of money collected from his friends. Curiosity was an integral part of his life. In his father's office different varieties of tobacco pipes were provided for clients belonging to different Hindu castes, as were the prevailing conditions during those times. Similarly, different tobacco pipes were kept for Muslim clients. Narendra smoked tobacco from all the pipes and when rebuked for doing the same, he replied, "I could not figure out the difference." He was very eager to know about the God. He went to meet Devendranath Tagore, a leader identified with Brahmo Samaj and asked him, "Sir, have you seen God?" Tagore was surprised by this question and said to him, "My child, You have to have the eyes of Yogi. You should practice meditation." This was the case with almost all leaders of various sects whom he approached with the same question, which never satisfied him. "Never mind failures; they are quite natural, they are the beauty of life, these failures. What would life be without them? It would not be worth having if it were not for struggles. 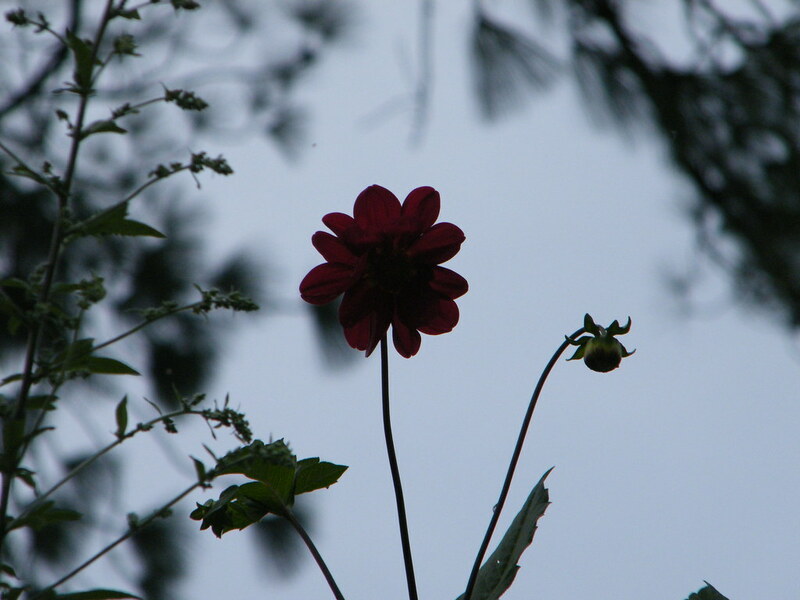 Where would be the poetry of life? Never mind the struggles, the mistakes. I never heard a cow tell a lie, but it is only a cow—never a man. So never mind these failures, these little backslidings; hold the ideal a thousand times, and if you fail a thousand times, make the attempt once more." "To succeed, you must have tremendous perseverance, tremendous will. “I will drink the ocean", says the persevering soul; "at my will mountains will crumble up". Have that sort of energy, that sort of will; work hard, and you will reach the goal." -Vedanta philosophy : Lectures by the Swami Vivekananda on Raja Yoga (1899), Ch. VI : Pratyahara and Dharana.